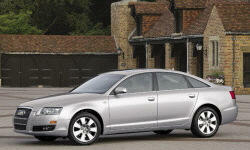 Why the 2008 Audi A6 / S6? the exterior is just very slick and aggressive in the 2008 A6. I love the light silver metallic color, the design of the S-line side skirts and front and back bumpers as well as built in "pinched looking" lip on the back trunk. Everything.. The fact every seat in the car is heated plus steering wheel. The way everything such as the console lights up just enough for you. Learning the MMI is pretty simple to learn. There is not 1 thing i dont like about the interior. 08 a6 was rated high from what i was told in safety. It has a lot of air bags and its a solid car.These brakes saved my life pulling out after dinner making a left as the sun was blinding.I thought i floored it and my brakes stopped me 1" from a car. I am guessing by saying "control design" this may be talking about control of everything inside the car or the handling. I love the control of the MMI. A friend has 530 bmw and i dont like it. This car has never let me sitting and would hope not for the money paid except when i let the gas run to low and was a minute from a gas station. The paint seems to scratch very easily which i have my car in a garage and somehow find new scratches. Why Not the 2008 Audi A6 / S6? Maintanance cost are expensive but that is what should be expected if driving around this caliber of a car. Even just a tune up looks like it will be over 350$. I worry since i have no warranty if after 70k miles issues arise.. i hope not. The fact that it is a loud car if outside of your A6. I am sure ppl know what i am talking about. To this day i swear the AC or something involving the fans are running all the time. I dont see a button to turn on or off the AC..
Not a lot of 26 year olds in my town are driving the car i have so i get looks allll the time. but anyway, Depending how much money you have to put down and make, will determine if u have a 500 $ payment since i was 11k upside down on my trade in. I am surprisingly lucky in this department. I know insurance will be based on where you live and keep the car. But in PA I have full coverage and pay 106 a month and Just got rid of my "blow n go" for a dui 1.5 yrs ago. I lost about 5k of value so far.